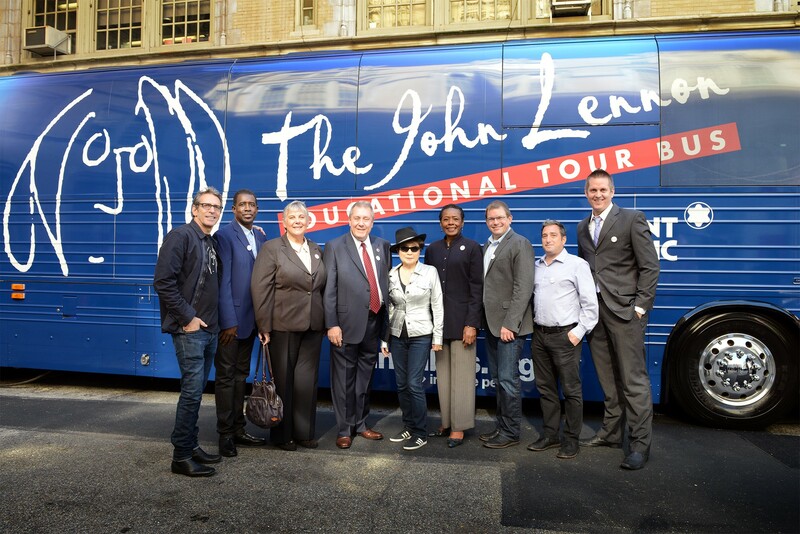 October has been quite the month as the John Lennon Educational Tour Bus kicked off its New York City residency with stops in all five boroughs. 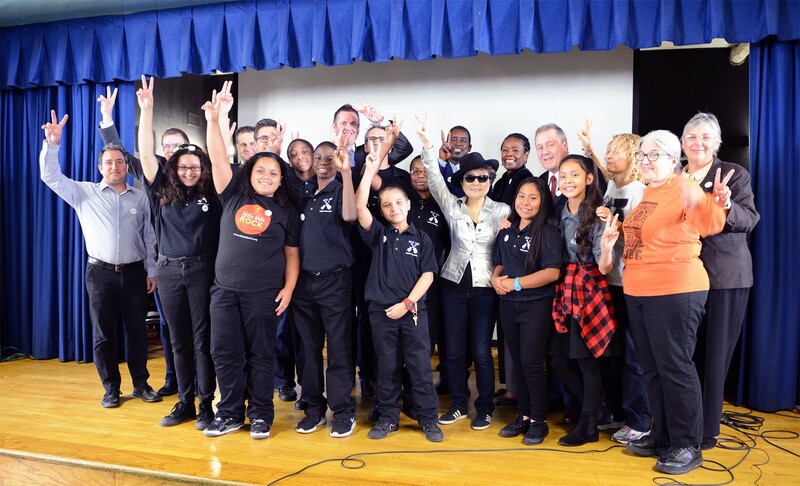 The first visit was to PS171 / CPE II in East Harlem with Yoko Ono Lennon. That set the stage for our stops in Queens, Staten Island, the Bronx and Brooklyn, where we visited schools in association with our partners at the NAMM Foundation, Little Kids Rock and Amp Up NYC. The stop in Staten Island at The College of Staten Island High School for International Studies showed, once again, just how much a school’s success is based on parents getting involved with teachers and the administration to ensure positive results. In the Bronx we were stationed at Crotona International High School and, in addition to the recording of an original music video project, the entire student body formed a human peace sign. Kudos to Principal Jesseca Long and her team, who have an inspiring digital media program in which students learn real world career skills working with all of the amazing applications found in Adobe Creative Cloud. Next up…our Queens stop was at W.C. Bryant High School where we were joined by singer/guitarist/U.S. Representative, Joseph Crowley, who spent time playing on the day’s track and sharing his love for, and memory of, the Beatles and John. Also on hand was recording artist duo, Nina Sky of “Move Ya Body” fame, who spent the entire day mentoring the budding songwriters and musicians. I took a great tour of the school with the principal, Namita Dwarka, who was a graduate of W.C. Bryant herself; she gave me an overview of the school’s illustrious history, including the fact that legendary actress/singer Ethel Merman was a student there way, way back in the day. Finally on October 9th, for what would have been John Lennon’s 74th birthday, we parked at the Williamsburg Northside School and created another peace sign, but this time with tiny tots who got the chance to jam out on Yamaha keyboards and drums and Gibson guitars. New York State Assemblyman Joseph Lentol helped coordinate the stop and I learned about his initiative, with the chief executive of Downtown Music Publishing, Justin Kalifowitz, and studio owner, William Harvey, to provide tax credits to help keep the music business in New York City. You wouldn’t think that was really needed but if everyone just assumes we’re the center of the biz, don’t be surprised when L.A., Austin or N.J. starts making it worth everyone’s while to pick up and move. It’s happening already. Bringing the Lennon Bus to the city has always been a challenge. Despite our status as a non-profit, 501(c)(3), the red tape, permits, and rules related to bringing an oversized vehicle here has only gotten worse since our launch in 1998, when we parked in front of Webster Hall for the “Imagine Party.” The success of that event led to the opportunity for millions of students across the U.S. to experience the studios and produce original music and videos on-board our state-of-the-art facilities. Looking ahead to 2015 and the 75th birthday celebration, I’d like to dig in even deeper and spend more time supporting the students from the city that John called home. With help from our growing list of friends, parents, artists and public servants including NYC Council member Daniel Dromm, Congressman Crowley and Assemblyman Lentol, we’ve got a shot to make it work. Perhaps we should try and stage the world’s largest peace sign and show our kids that we actually think that’s possible. Imagine that. John Lennon once likened his and Yoko’s activism to a marketing strategy. “Peace. We’re selling it like soap.” is what he said. That’s kind of the idea behind the John Lennon Educational Tour Bus. Give peace a chance by giving kids a chance to collaborate and create original music, videos, films, documentaries, games, apps, etc. If they’re given creative outlets, maybe the next generation can find the road to peace, or the path to a career they really enjoy. Recently the Lennon Bus and Yoko kicked off a NYC residency in honor of what would have been John’s 74th birthday on October 9. Hopefully this will be the lead up to something even bigger for the 75th celebration next year. Maybe break the record for the world’s biggest human peace sign in Central Park? In the meantime, we’ve got sessions coming up that take the Lennon Bus to all 5 Boros in association with Amp Up NYC students. First stop: PS 171/CPEII in Harlem. The students are in K-6th grade, and upon arrival, Yoko walked to the big blue Bus where an extremely enthusiastic crowd of young musicians were gathered. You wouldn’t have expected it, but they were actually jumping up and down, excited to be meeting the iconic artist and peace activist. Looking like a rock star in her silver jacket, she warmly greeted the kids, looked each of them in the eye, connected with their energy, shared high fives, and joined the group for some photos. Next up: Meet and greets with the NAMM Foundation, Little Kids Rock, Amp Up NYC, NYC Public School’s Director of Music, SESAC, Council Member Daniel Drumm, and SESAC’s Trevor Gale. There’s a lot of peace sign throwing when you’re with Yoko. 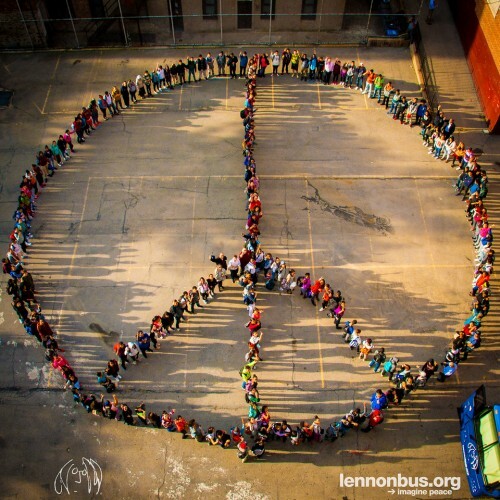 I heard someone say ”that’s a real peace sign.” Then…more photos with the incredible Lennon Bus staff. Those guys deliver the special goodness of the Bus with just the right mix of “Power to the People” and “Imagine” with maybe a touch of TLC’s “Waterfalls”. From there we went up to the Principal’s office. Yeah we’re bad. We then made our way into the auditorium where 400, mostly young children gave “silent cheers” (wiggle your hands high up in the air) and listened to adults talk about the importance of music education before the young musicians took the stage with Lennon’s “Instant Karma”. The whole school joined in on the chorus (thanks Matt! ), and then Yoko Ono Lennon took the stage. She read her piece titled “Make Your Heart Dance” and then led the kids in a spontaneous affirmation that was very well received by the young crowd. I’m sure the kids won’t forget it. What’s better after an affirmation than a group sing-a-long of “Give Peace a Chance”? Nothing. So that’s what we did. We hear a lot about how bad schools are, but on that day, at that school, you couldn’t help but be impressed with the teachers and staff, and of course most importantly with those kids, but the lunch room does smell just like a lunch room. I’ve been thinking a lot about how we can ensure that our students across the US receive a quality arts education. So frequently it seems as if its viewed as an “extra”. A frill - not serious or part of the important dialogue. My friend Mary Luehrsen at the NAMM Foundation sent me this link which outlines a study connecting music and arts education with an increase in high school graduation rates. Maybe if everyone realized this we’d have the problem licked. The Florida Times-Union did a great job covering our recent visit to Ribault High School in Jacksonville, FLA. Check out these great photos and read the captions that Andy Jacobsohn put together. They really tell the story of what the Bus does better than anything. For starters, eleventh grader Chris Taylor says “This is the best experience I had my entire life, I swear it is.” For a more indepth story, check out the media coverage. If you’re in NYC between now and the end of the year, you must stop by the Rock and Roll Hall of Fame Annex. They are running an exhibit put together by Yoko that features many items related to John’s time in New York. The Lennon Bus got special permission for 4 amazing NYC Public School students to attend the opening’s press conference where they had the chance to interview Yoko, Photographer Bob Gruen, and Curator Jim Henke. The resulting video piece focuses in on the students, who helped shoot the footage and were obviously moved by the experience. Check it out here, and let us know what you think. We all had quite the day yesterday for the kick off of NAMM’s Wanna Play? campaign. The idea is to get everyone playing music. So don’t worry if you don’t think you’re talented, or not good enough, pick up that dusty guitar and get started making music. On hand we had the Bacon Brothers, Michael and Kevin, who graciously agreed to work with students from LaGuardia High School in NYC. After their appearance on Fox and Friends, we hustled our Bus(tle) to the school where none other than Yoko herself stopped by to wish the kids well. Last night I had the incredible opportunity to see Soledad Barrio and Noche Flamenca at the New Victory Theater on 42nd Street in NYC. Flamenco dancing is highly sophisticated and very emotional. To be honest, I was stunned. The music, the singing, and the rhythms were all uniquely intertwined with the dancing performed by a troupe with meticulous storytelling skills. The contrast of sound and silence further punctuated the experience. It was so raw and scary too - a glimpse into a culture that blends many influences, yet is undeniably unique. Did I mention that Soledad Barrio’s performance is magnificent? That she commands the stage and everything around her? She’s an incredible artist. You need to go see this show. Hopefully they will be back in October when we might produce something on board the Bus with them. In the meantime, check this out. Wanna Play Music with Energy Maburutse? We’re gearing up for the kick-off of NAMM’s Wanna Play Music Week. While checking out their site, I came across this great piece that our friend Energy, from Liayana shot in support of the effort to get more people of all ages and backgrounds playing music. If you missed “Diversity”, the Liyana video we created with the band and students from San Fran, check it out now! They’ve been huge supporters of the Lennon Bus since the beginning back in 1998, so I thought it only fitting to share the excitement about the new song and great success its already having. Check it out here.